Celebrity Solstice. Restaurant. Grand Epernay. Adam Tihany. Celebrity Solstice is the first of five in the Solstice Class of vessels deployed by Celebrity Cruises on behalf of Royal Caribbean International. 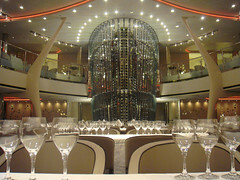 Other vessels in the Solstice class include the Celebrity Equinox and the Celebrity Eclipse.